On June 16, 2018, R.W. Rev. 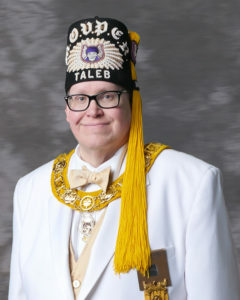 Matthew J. Wissell (Bay Path Lodge, West Brookfield) was installed Grand Monarch of the Grottoes of North America at their 128th Annual Supreme Council Session in Indianapolis, IN. We recently “interviewed” Prophet Wissell about Grotto and the value he finds in his membership, his goals as Grand Monarch, and what he would like others to know about Grotto. Note: Brother Wissell’s answers have been lightly edited for length and clarity. Congratulations on your election and installation as the Grand Monarch for Grottoes of North America. How did you arrive here? My experience with the Grotto began when I served with R.W. Carl W. Landerholm Jr. (Baalis Sanford Losdge, Brockton) on a Masonic Leadership Institute leadership team. He was a Grand Line Officer at the time and shared with me the Goodfellowship, Friendship and Fun of the Grotto. I was interested, and in 2001 joined the closest Grotto to where I was living – Taleb Grotto – then meeting in Quincy. Enjoying the experience, I became an officer. When Carl became Grand Monarch, he asked me to serve as his Grand Chaplain; that experience exposed me to Grotto on an international level. I felt very comfortable in that environment and found Grotto Prophets and their families to be some of the most genuine and nicest people in Freemasonry. I was blessed to serve as Grand Chaplain for a few other Grand Monarchs, two years as Monarch of Taleb Grotto, and two terms as President of the New England Grotto Association. With the encouragement of many Prophets and the support of Amy (Matt’s wife) and Taleb Grotto, I ran for Grand Captain of the Guard and in 2011 was elected to the Grand Line. One progresses up the Grand Line for seven years before being installed as Grand Monarch. Words cannot adequately express the thanks that is due to the Prophets and Ladies of Taleb Grotto for their help on this journey. Taleb Grotto has a long and distinguished history in the Grottoes of North America and I am honored to be the fifth Grand Monarch from our Grotto. What are your goals for your term as Grand Monarch? My theme for the year is “It’s Showtime.” The primary goal of every Grand Monarch is to grow the membership of our beloved organization. We have more than 10,300 members in 128 Grottoes across the US and Canada. Every year we initiate enough new Prophets to replace those who enter the Celestial Lodge. Demits and Suspensions are our biggest membership issue. My challenge to the Grottoes is to focus on the Goodfellowship, Friendship, and Fun that makes us so special. In this time of great cultural divide in our society, we ought to be examples of who can best work and best agree. If we can show members of the Craft there is a place where true friendship is valued above all else and a good time is had by all, we will not only keep the members we have, but increase the Enchanted Realm. I will be visiting Grotto Associations throughout the country and hosting the 129th Supreme Council Session next June in Branson, MO. Describe the Humanitarian Foundation and its work? The Humanitarian Foundation (HF) is the charitable arm of the Grottoes of North America. We provide dentistry for children with special needs. Each Grotto has a “Dr. of Smiles,” who is a liaison between the Grotto and the HF. They connect patients with dentists who can provide proper services. The HF covers the costs of dental treatment, excluding hospital and hospital anesthesia charges, for children with cerebral palsy, muscular dystrophy and related neuromuscular disorders, those with intellectual disabilities, including Downs Syndrome, and dental treatment for organ transplant recipients. It warms our hearts to bring special smiles to special kids. Visit HFGrotto.org to learn more about the Humanitarian Foundation, including how to donate to support our efforts. Most Grottoes are involved in charities in their communities as well. What would you like the average Mason – who may be unfamiliar with Grotto – to know about the Order? The Mystic Order of Veiled Prophets of the Enchanted Realm aka “The Grotto,” is an organization open to any Master Mason in good standing. We are dedicated to “promoting Goodfellowship, Friendship, and Fun amongst Master Masons.” Candidates are received through a Persian-themed ceremonial known as the Order of Veiled Prophet. After initiation, Prophets are entitled to wear our trademark black fez, signifying membership in our Order. Grotto was founded to continue the fellowship of the Lodge without the formality and protocol. Grottoes meet in a variety of places such as Lodge rooms, restaurants, function halls, and churches; some own buildings. They have a minimum of eight stated meetings a year. Many have units such as bands, parade units, and clowns. Wherever they are, you will find Prophets laughing, enjoying each other’s company and having fun. We have a sister organization for ladies known as the “Daughters of Mokanna” and many Grottoes have a ladies’ auxiliary. If a Brother would like to learn more about joining Grotto, or starting a Grotto if one does not exist in his area, what would you advise him to do? There are five Grottoes in Massachusetts: Aletheia in West Boylston, Azab in Westport, Bela in Hatfield, Nava in Attleboro, and Taleb in Braintree. Moslem in Cumberland, RI has many Prophets from Massachusetts. These Grottoes would love an inquiry from an interested Brother. Meeting times and contact information for these Grottoes is available on the Supreme Council’s website: www.scgrotto.org. If you are interested in starting a Grotto or just wish to discuss the Grotto you are welcome to contact me at mjwissell@gmail.com. R.W. Rev. Matthew J. Wissell was raised in Bay Path Lodge in 1994 and served as its Master in 1998. He also presided over Mount Lebanon Lodge (Boston) from 2009 through 2011. He is a past Secretary of both Lodges. M.W. Fred K. Bauer (North Reading Lodge) appointed him Grand Chaplain in 2001, a position he continues to hold. He is Grand Representative to the Grand Lodge of Tasmania. Initiated into Taleb Grotto (Braintree) in 2001, Prophet Wissell served as Monarch in 2005 and 2006. He was President of the New England Grotto Association in 2009 and 2012. Four times he served Supreme Council as Grand Chaplain prior to being elected to the Grand Line in 2011. An active member of many Masonic organizations, Brother Wissell was exalted in Eureka Chapter, greeted in Hiram Council, and knighted in Worcester County Commandery #5 (all of Worcester). He is past High Priest of Eureka and Adoniram (New Bedford) Chapters; past Illustrious Master of New Bedford Council; and past Commander of Cape Cod Commandery #54 (Centerville) and Sutton Commandery #16 (New Bedford). He is a Grand Chaplain for the Grand Chapter and Grand Council of Massachusetts, as well as Grand Prelate for the Grand Commandery of MA & RI. The Grand Chapter of Massachusetts awarded Brother Wissell the Benjamin Hurd Jr. Meritorious Service Medal; the Grand Council presented him the Abraham A. Dame Medal for Meritorious Service. He is a member of Massachusetts Priory #52 of the Knights of the York Cross of Honor. Brother Wissell’s journey with the Scottish Rite began in 1994 in the Valley of Worcester. He served as Thrice Potent Master of Worcester Lodge of Perfection, as well as their Secretary. He was also Secretary of the Valley of Southeastern Massachusetts (Wareham). He received the 33゜ in 2011 at the Supreme Council Session in Chicago. A member of Aleppo Shrine (Wilmington) since 1995, he has served as a Shrine Club President, member of the Clown Unit, and Chaplain. He is a Past Governor of Mayflower York Rite College #105 (Marlborough); a member of St. Matthew’s Conclave of the Red Cross of Constantine, Colonial Council #19, Knight Masons (Framingham), and the Royal Order of Scotland. Hailing from Central Massachusetts, Matt graduated from Framingham State College (BA) and Boston University School of Divinity (MDiv). An Ordained Elder in the United Methodist Church, he is pastor of Holy Trinity UMC in Danvers. He has been married to Amy for 18 years. Matt has served as a Fire Chaplain for several departments and is Secretary of the Massachusetts Corps of Fire Chaplains. He is also the Northeast Region Chaplain for the Civil Air Patrol.